Without full knowledge, the for sale by owner strategy might feel like a great way to save money when you sell your house. Can you take time off of work every time someone wants to see your house? Can you place regular commitments such as tasks and meetings on hold every time your phone rings with a potential buyer? At the end of a long work day focusing on your duties, will you still have the energy to perform the activities necessary to market your house? Are you an expert in marketing that attracts buyers to visit and ultimately purchase real estate? Do you have any experience selling real estate? If yes, is your experience relevant to current market conditions? Your answer to many or all of these questions is probably NO. Rise Up Realty Consulting’s answer to all of these questions is YES. Work with us when you want to sell your house. We have a proven track record of success. Hire a professional real estate agent to help you achieve professional results. Selling your house can be an emotional, stressful process. Hiring a Realtor keeps you one step removed from buyers and buyers’ agents. We will serve you as a trusted third party and consult with you to reduce your chances of making common mistakes such as overpricing your property, refusing to counter a low offer simply because you’re insulted, or settling for an unreasonable offer when you have a deadline for selling. Rise Up Realty Consulting can speak with buyers and buyers’ agents to find out information without being held accountable to know your bottomline or answer other tough questions. Be sure that buyers and agents would definitely ask you these tough questions directly if you were representing yourself. Also, people can be pretty blunt or even rude with comments about the price, the condition of the property, the decor, etc. As the owner, these remarks would likely stir up resentment, anger, frustration, or other negative emotions. Why not let us serve as a healthy buffer? This way you can be assured that your sale, which is your ultimate goal, will not be blown due to quick, emotional reactions on your part. Seasoned Realtors understand what you will need to do to sell your house. Agents can see issues you overlook either because you see them every day or because you simply don’t view them as unattractive. Think that color or that smell that you’ve grown used to but will cause every potential buyer to turn around and walk straight out of the door. We can walk through your property with you and help you understand what changes you need to make. Changes that will help you receive maximum value in minimum time when you sell your property. We may advise you ourselves as well as offering recommendations to consult with a property stager, an interior designer, a professional cleaning service, and a real estate photographer to help you prepare your property for today’s market. Many sellers believe their house is worth top dollar, yet the buyers in today’s market may disagree. Many sellers lose momentum due to overpricing their house from the start. Then, they aren’t sure of the proper course of action based on feedback received from potential buyers once the house is on the market. They can also be too slow to reduce their listing price when a buyer fails to surface. A sharp agent will help you with proper pricing plus assist with navigating the market once your property is listed for sale thus improving your chances of selling. Working with Rise Up Realty Consulting is the right choice. Agents work hard to determine whether someone who wants to view your house is a ready, willing, and able buyer or simply a time waster or curious neighbor. It’s a lot of work and a major inconvenience every time you have to change your plans, make sure your house looks perfect, We will help you prescreen interested buyers and buyers’ agents to the ensure showings are scheduled with buyers who are most likely to pursue a sale. Also, most buyers appreciate a private showing when shopping for a house. How are you able to provide this opportunity? Your choices are to either be awkwardly present or to vacate the property altogether and leave potential buyers unsupervised in your house. A seller should never be present when selling their house. Rise Up Realty Consulting will be there to accomodate showing requests and professionally supervise private showings buyers will enjoy. When working to close a transaction with a for sale by owner seller, buyers’ agents know they won’t have a professional colleague on the other side of the transaction. For this reason, agents typically show serious buyers properties professionally listed for sale. Even if a buyer wants to see your house, their agent might discourage the from seeing it or making an offer due to potential hassles and risks involved with pursuing a sale without a professional colleague representing the seller. Also, agents may ask you to pay a commission and they will likely refuse to show your house without a guaranteed commission agreement in place. Many real estate agents see for sale by owner sellers as unrealistic when it comes to the the price of their property. Others see for sale by owner sellers as unreasonable because they often do not want to work with agents or pay a commission. As a result, they stay away from these properties to avoid difficult sales situations and rough experiences their clients might not want to deal with when purchasing their new house. Hire Rise Up Realty Consulting to make sure you present yourself as a serious seller who will work with buyers and buyers’ agents in a professional manner when you sell your house. Sure, you can list your house without hiring an agent on several popular websites. Will that be enough to sell your property? Your personal or professional network will not likely have much interest in making it known that your house is for sale. Do you have relationships with past clients as well as other agents and brokers to attract the largest pool of potential buyers to your property? Less potential buyers means less demand for your property. This means your house will sit on the market longer while you wait to find a buyer. Time on market erodes value, so there will be a strong possibility you will eventually agree to sell your house for less than it’s worth. Work with Rise Up Realty Consulting to experience a smooth, successful sale. Most people have little or no sales and negotiation experience. Even if you do have sales experience, you probably don’t have specialized experience negotiating the sale of real estate you own. A serious buyer often has an agent they bring to the deal, so you may find yourself negotiating with a buyers’ agent who has skills and experience helping them win the negotiation. This means less money in your pocket when you sell your house. Rise Up Realty Consulting has extensive training in sales and negotiation as well as experience negotiating close to one hundred real estate sales. Rather than missing important contractual clauses or failing to capitalize on points of negotiation that may be unclear to you, let us help you implement a strategy that allows you to see things clearly and make the best decisions. We are familiar with local customs and market conditions. We understand current supply levels and what’s driving demand. We will help you understand which terms are worth negotiating for and which are worth conceding to the other party. Small differences in negotiation can mean large differences in outcome. Let Rise Up Realty Consulting help you sell your house. The sale of real estate requires the use of legal contracts as well as legal disclosures regarding the property itself. The process needs to be completed correctly and an expert can be a huge help. As a seller, you have a legal obligation to disclose any fact that materially affects the value or desirability of the property. Failure to properly disclose can blow your deal at a minimum and result in a lawsuit in worst case scenarios. A seller can be held liable for fraud, negligence, breach of contract, or default of agreement. A seller could be found liable to pay liquidated damages, attorneys fees, and court costs if a court finds the seller liable. Unless you’re a real estate attorney, we probably know more about the laws regarding real estate sales, agency, and disclosure than you. One small mistake, such as failure to disclose a material fact including a defect, hazard, nuisance, or some other deficiency, and a buyer has the right to file a lawsuit against you to recover damages. Agents can make mistakes, too, but they have professional errors-and-omissions insurance to protect themselves and to give the buyer recourse. This means the buyer may not need to pursue the seller for damages as the agent and their insurance company might make a more solvent, collectible, and attractive choice for them to sue and recover damages. Hire Rise Up Realty Consulting to minimize your risk and have peace of mind when you want to sell your house. The sale of your house will likely be one of the largest transactions of your life. You can try to do it alone, but working with Rise Up Realty Consulting has many advantages. We will get more exposure for your property. We will help you negotiate a better deal. We will dedicate time and energy to your sale. We will help you keep your emotions from wrecking the sale. We bring expertise to a complex transaction with many financial and legal pitfalls. 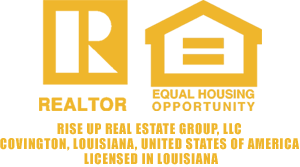 Why go it alone when you can work with a professional like Rise Up Realty Consulting?